Chinese New Year celebrations are already underway, beginning with Little New Year towards the end of January. Chinese New Year begins on the 5th of February so here are 7 things you may not know about The Spring Festival. We have also written a blog post called 8 types of bread for the Chinese New Year , let us know if you have ever tried or made any of these breads! In Chinese culture, pigs are seen as a symbol of wealth, the chubby nature of their faces and large ears are also a sign of fortune. They are realistic but energetic and enthusiastic. They blend in but when they have the opportunity, they will take positions of power and status. They work hard, but this is fuelled by them being slightly materialistic. They enjoy life but also do not waste their time. The date of the Chinese New Year is determined by the new moon. The new moon is the phase that is invisible to us here on Earth because the moon is between the earth and the sun, and its illuminated side is facing away from us. The new moon marks the beginning of the lunar cycle. This occurs between the 21st of January and the 20th of February. Little New Year occurs a week before the Chinese New Year and one of its most typical traditions is the burning of a paper image of the Kitchen God, who watches over the moral character of your household. Burning the paper sends the God’s spirit to heaven to report on the household’s conduct over the past year. The Lantern Festival occurs at the end of the Chinese New Year celebrations. The festival has been occurring for thousands of years so has developed many meanings for many different people. However, a couple of the key themes of celebration are society and family reunions. 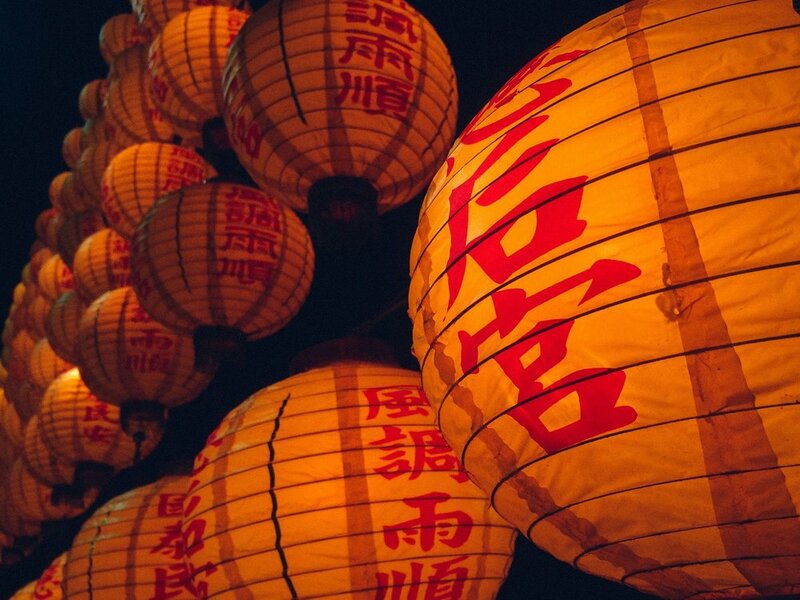 There are many activities which people partake in during The Lantern Festival, some of these include lighting lanterns, moon gazing and dancing. Chinese New Year always falls within the solar term ‘Start of Spring’, the Chinese traditional solar calendar has 24 terms. The ‘Start of Spring’ also represents the beginning of the farming calendar. The start of The Spring Festival represents the beginning of planting, harvests and fresh starts. Colours which are closely associated with The Chinese New Year are yellow and red (there are others, but we are focusing on red, yellow and gold). In Chinese culture, red symbolises good fortune, joy and happiness, it’s a common colour used throughout The Spring Festival and decorations are often red. Shades of yellows and gold are also common colours. yellow indicates a higher status; it represents power, loyalty and also prosperity and gold symbolises wealth and riches. The Chinese New Year festivities all celebrate and emote good fortune and there are certain things not to do in order to carry on promoting happiness and luck. For example, during the celebrations, sweeping and cleaning is frowned upon so to not sweep away the good luck. Another is to avoid fighting and crying unless there is a special circumstance, if there are any arguments then issues should be solved peacefully to enter the new year smoothly. A third is not to say negative words, this again links to the good fortune and not wanting to bring any misfortune on yourself or your family. Do you have any other facts about Chinese New Year? Let us know below!